Prior to being elected secretary of state last year, Jocelyn Benson had a long career dedicated to both civil right and voting rights. 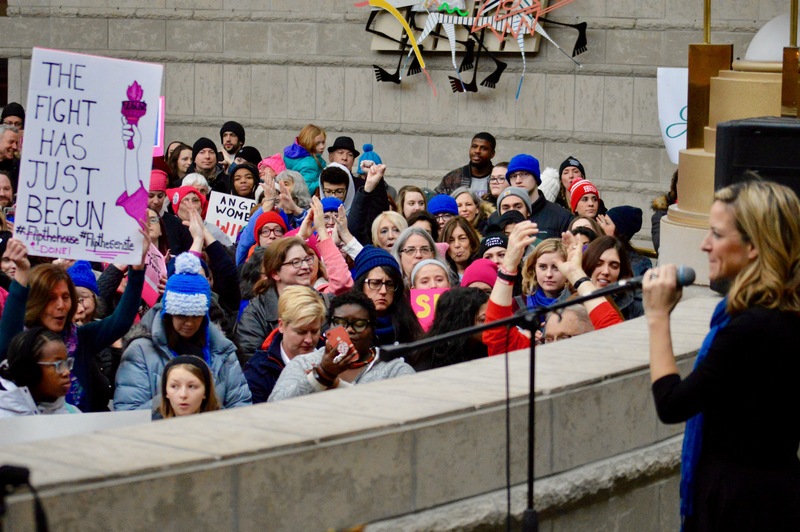 On Saturday, Benson spoke at the Women’s March in Detroit, where civil rights and racial equality were prominent themes. Many Democratic officials attended, including U.S. Sen. Debbie Stabenow (D-Lansing), U.S. Rep. Rashida Tlaib (D-Detroit) and U.S. Rep. Brenda Lawrence (D-Southfield). The Michigan Advance sat down with the Detroiter last week and talked to her about the last Democratic secretary of state, Richard Austin, who was the last African-American statewide executive until Lt. Gov. Garlin Gilchrist II was sworn in on Jan. 1. Benson also reflected on Martin Luther King Jr.’s legacy in voting rights and civil rights. The Advance previously ran a story from the interview in which she discussed being part of a team of female executives in Michigan, making good on her campaign promise of the 30-minute guarantee at SOS offices, asking for an attorney general opinion on a new law restricting ballot measure and more. Michigan Advance: You are the first Democrat to serve as Michigan Secretary of State since Richard Austin in 1995. What does that mean to you? Benson: I feel connected to Secretary Austin as an innovator and we just happen to be members of the same party. And we are both members of the party the gave us the Voting Rights Act [of 1965]. That sort defines my loyalty as a Democrat and why I chose to run as a Democrat. That said, his work as an innovator in our driving as well as with the seat belt laws and driving safety and modernizing our elections is something that I hope to emulate on both fronts. It’s an honor to be following in his footsteps. I’m also the first Detroiter [to serve as Secretary of State since Austin]. Opening up the Secretary of State executive office in Detroit, which he also had, is something that I’ll be doing. That’s important to me. It’s a unique moment in our city’s history and having a strong connection with the city of Detroit and Secretary of State, just like he did, is going to be important. Michigan Advance: The Martin Luther King Jr. holiday is coming up. You’ve done a lot of work in the areas of voting rights. Voting rights, of course, was important to Dr. King. Is the holiday important to you? Benson: Bloody Sunday, the first Sunday in March, from the standpoint of civil rights is the holiday that has meant the most to me. Particularly because of the sacrifices that were made in Selma, [Ala.], that led to the passage of the Voting Rights Act and related to that, obviously Dr. King’s leadership, we celebrate on Monday. To me, really what the day is and what his legacy is a recognition that his work for equality — that we celebrate in many ways — continues and is not ended. His work ultimately cost him his life. I think is important to recognize when reflecting on his life and legacy.